On the top side of our last record we reviewed The X-Rays I’ll Always Be In Love With You, a big hit heading into the new year for a group that had been practically formed on the spot in the studio by Savoy Records, comprised of a lone singer with a bunch of instrumental mercenaries playing behind him. Today we look at who they stole the record from… a group named after a brand of battery of all things that both sang and played the instruments themselves and would endure for years called The Ray-O-Vacs. If one thing has already become clear here on Spontaneous Lunacy after the first 15 months of rock’s story has been told it’s that I don’t venerate the record label owners as much as a lot of histories do. I’ve criticized the likes of the revered names such as Ahmet Ertegun, Sam Phillips and Leonard Chess as well as taking potshots at others far less respected than that triumvirate. I’ll give them plenty of credit when it’s deserved but my main concern is the records and the creative people who made them, not the ones who stood to profit off that creativity. I’m all for profit (and if you don’t believe me I dare you, just DARE you, to click on an Amazon link or iTunes badge, buy what’s being sold and watch me greedily keep my 5-7% commission! ), but whereas many writers over the years fell under the spell of the surviving independent record label pioneers who cannily knew how to schmooze with them in every interview request in order to bolster their own legacy in the process, I’m either cynical enough, smart enough or contrarian enough to see through those aims and simply focus on the results – the records themselves. Now Herman Lubinsky was certainly NOT revered during his era nor even after his death. In fact he’s often cited as the stereotypical cigar chomping cheapskate who swindled artists left and right, a crude vulgarian who had no love for music and who alienated those around him with alarming frequency and over time saw his record label, which had beaten virtually all of his competitors to the line (launching in 1942), start to fall behind as a slightly more sophisticated independent record business emerged by the end of the 1940’s and dawn of the fifties, many of which featured more musically astute owners at the wheel. As rock’s commercial might increased Savoy’s early successes in this field dwindled as its biggest artists, not to mention many of its roll call of great producers and A&R men, left for less hostile environs. But we’re getting ahead of ourselves. The point is the record business was churning out what passes for art, but doing so for business, not artistic, reasons, and as such their goal was to get hits, make money and stay solvent. Lubinsky epitomized this approach and while it generally makes for less than glowing testimonials in later years, there’s nothing particularly wrong with that relentless focus on the bottom-line. Which is why when Lubinsky somehow got to hear The Ray-O-Vacs version of I’ll Always Be In Love With You cut for small Coleman Records, a fellow Newark, New Jersey based label started by gospel singers, it was hardly a surprise when ol’ Herman rushed into the studio with an ad hoc group featuring hot as can be at the time Hal Singer on saxophone and cut a hasty – but effective – version to compete with it. Nothing underhanded or unethical there at all, especially in 1948 when this type of practice of covering a potentially hot record with a variety of artists was commonplace across ALL musical styles. Bing Crosby, the most successful and respected name in pop, never let a record that sold 50 copies in Des Moines, Detroit or Dubuque go by without laying his own version down and cutting into the original’s potential sales. The difference here was that Coleman Records, through its own lethargic impetus, was slow to release The Ray-O-Vacs original take on it and so The X-Rays got to market first and once it did they took that head start and ran with it, scoring the bigger hit. That’s not Lubinsky’s fault at all. If anything shame on Coleman for not being quicker on the draw. In truth though could it really be called stealing when the song itself was twenty years old already and had been recorded by dozens of people during that time, as was just detailed on the review of The X-Rays version? I mean, the song was available for anybody to do with what they wanted and release it for public consumption. So what if Lubinsky used The Ray-O-Vacs remodeled approach as the blueprint for his own record? Once he’d done so others followed suit as well, thinking they were taking that arrangement from him, just as he’d taken it from The Ray-O-Vacs. None of THEM apologized for it, so why should he? So what we’re left with are two records of the same arrangement of the same song released one after the other (Coleman rushed theirs out to avoid being caught with their pants completely down, both labels touting theirs as the original in the process) and may the better version win. Unlike The X-Rays, who were just session musicians fronting an unaffiliated vocalist for the purpose of cutting this one song in a hurry, The Ray-O-Vacs were a self contained group in every way, making them rather unique for the time in rock. Usually there were vocal groups consisting of four or five guys who sang and maybe they had one permanent accompanist who was their bandleader when they went on the road, teaching house bands the arrangements and making sure there was some consistency to their sound from the records to the bandstand. In the late 1940’s we were still a ways off from the singers who also played the instruments being more than a random oddity in self-contained groups (as opposed to solo artists whose backing musicians didn’t get more than passing credit, if any at all). We had seen it thus far with The Scamps for one, and we’d see it again a little down the road with The Four Blazes among others, but it wouldn’t be until the 1950’s when groups really began to emerge that handled both aspects rather than rely on session musicians. 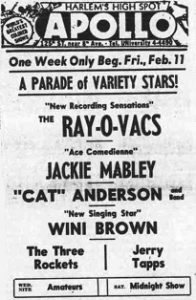 The Ray-O-Vacs were among the first to break the mold, as they each played instruments, lead singer included. But enough about the minutiae, what about The Ray-O-Vacs record of I’ll Always Be In Love With You and how it differs, or is similar, to The X-Rays imitation? To start with it kicks off in more of a mellow haze than The X-Rays version, which had made sure to emphasize Hal Singer’s saxophone, the biggest star they had on their roster at the time and one of the leaders of the tenor sax movement that had swept the country throughout 1948, giving their intro an immediate rock feel that The Ray-O-Vacs simply can’t measure up to. Yet that’s not to suggest what The Ray-O-Vacs do instead isn’t worthy in its own right. The mood their version elicits, with the bass standing out nicely and a warm smoky sax – far less attention grabbing than Singer’s – adds a remorseful melancholia to the vibe. I guess if you just isolated the lead-ins without any knowledge of what was to follow and forced me to choose I’d go with The X-Rays over this one but it wouldn’t be an easy choice at any rate. Once the vocals come in though the differences become a little more pronounced and here’s where The Ray-O-Vacs take control of the song. On The X-Rays review we delved deeply into the song’s long history as a starched recitation of lost love from a puritan era which came through no matter who sang it. The X-Rays record had Milton “Tippy” Larkin give it a whirl and while his voice itself was up to the task of improving upon the usual delivery, his musical instincts were not quite as current as we’d have liked and so he wound up not advancing it far enough into modern sensibilities. The Ray-O-Vacs have no such problems. Lester Harris may indeed be the only voice on this, thus excluding it from a “vocal group” designation (in fact they’d never all sing together, though other members later took leads), but he otherwise shows he’s reasonably up to the standard set by such stalwarts as The Ravens Jimmy Ricks and The Orioles Sonny Til in terms of employing the proper reading of the material and matching the lyrics with an appropriate interpretation. Though certainly not in their class as a pure singer, he nevertheless is warmly inviting, coming across as sincere, humble and hopeful, the three qualities whoever sings I’ll Always Be In Love With You needs to project to make the song work. His one slight misstep comes in the bridge where he injects a few too many pauses, surely designed to add a measure of drama and anticipation to the reading, but which don’t really fit and makes it sound a bit awkward and clumsy, not to mention taking away from the best attribute of the song itself as written, which is the alluring melody that even the worst versions in the past kept at the forefront as their one redeeming feature. But that’s a minor quibble, the rest of the time he’s spot on, soulful and yet still approachable. It’s a modest performance for sure, there’s no look-at-me moments he employs, and one can even imagine him singing this with his eyes downcast, avoiding making emotional contact with the audience or the girl he’s singing it to. Yet that works as well because of the content of the material. The focus of the song is that of a man reminiscing long after his heart’s been broken and he’s left alone. Chances are he’s singing this to himself, almost like composing a letter he’ll never actually send to the girl who’s found someone new, and that makes his remorseful tone all the more effective. You feel for him in his plight which isn’t always easy when a guy is acting so dejected rather than going back out and grabbing himself a new gal to ease his pain. The instrumental backing fits within this context fine, keeping the mood rooted in a wistfulness that adds to the atmosphere. It can’t help but pale in comparison to The X-Rays more spry version, which shouldn’t be surprising since The X-Rays were merely a name slapped on to a bunch of hot-shot session musicians who were there specifically to heat up the wax with their playing. The Ray-O-Vacs, while solid musicians, weren’t in that league. Harris played drums in addition to singing, Flap McQueen was their bassist, Joe Crump played piano and Chink Kinney had the unenviable task of trying to measure up to Singer on the saxophone, which was a mismatch. But because they cut theirs first the group takes their own approach and Kinney’s efforts are perfectly suitable within the framework they’ve chosen. He blows a steady reflective tone that meshes well with the story and the vocal and while it doesn’t stand out like Singer’s more frantic blowing it is more appropriate for the attributes of the song and so for that reason as well as Harris’s superior vocal turn, The Ray-O-Vacs are the ones who come away with the slight overall edge on their respective records. In the future (think mid-50’s at the peak of the white cover craze of black rock songs) we’ll have plenty to say, and plenty to criticize, about the duplicitous act of ripping off a record, but the practice was commonplace in every genre of music until the backlash over it in rock – with the added cultural theft of white pop acts swiping black rock records and erasing their distinctive attributes so as not to “offend” mainstream audiences – put a quick end to it, but this shows that even amongst fellow rock acts there was no honor among thieves from the very start. 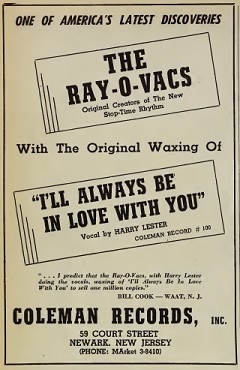 The X-Rays were rewarded for their pilfering of The Ray-O-Vacs idea on the charts, theirs peaking at #3 while this version only got as high as #8 in Billboard’s national listings, although in Cash Box it was The Ray-O-Vacs who were more successful, particularly in the Northeast and along the Canadian border, whereas The X-Rays dominated Chicago and Florida. But in the end I’m grateful we have both of these records, not just so we can delve into the seamier practices of the record business and get an added review out of it to boot, but also because each version has its own distinct merits that can be appreciated in their own right and the more rock music we can hear and make our own choices about the better off we all are. 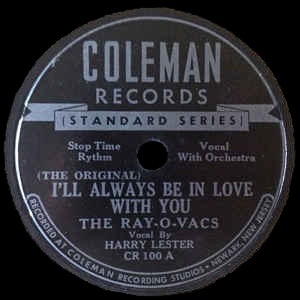 Leave a reply on "The Ray-O-Vacs: “I’ll Always Be In Love With You”"